Welcome to another Delightfully Inspiring Thursday Party! If you're new here and you haven't seen the monthly organization challenge that I have going on, feel free to join in. We'd love to have you! If you're following along with the challenge, PLEASE NOTE ~ this is NOT the January Challenge Link Party ~ Wait until the end of January to link your paper organizing posts. This is my weekly inspiring Thursday party. Thanks so much for hosting! I hope your week is going really well so far. 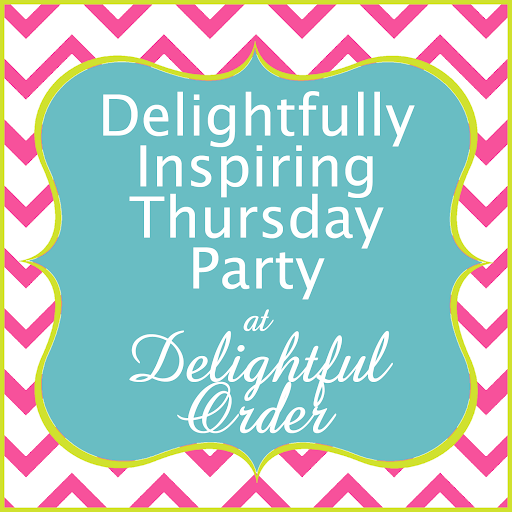 Thank you so much for hosting Delightfully Inspiring Thursday ... it's always fun! Thanks for hosting! Have a nice day!!! Thank you for hosting this delightful party! Thanks for hosting another great party. We are linked up. We are hosting our first party TODAY!! We would like to invite you to link up there. Thanks for hosting! We all appreciate the work you do to host a great party for us all to share our projects. Have a great day! I'm glad I found you. Thanks for hosting!